Let us take a look at the Enigmatical image in the hidden pages and dissect it a little. First off, lets look at the name of this page. "enigmatical"
Adj. 1. enigmatical - not clear to the understanding; "I didn't grasp the meaning of that enigmatic comment until much later"; "prophetic texts so enigmatic that their meaning has been disputed for centuries"
The page itself is named as to be foresight to something we will understand later. Okay, so the title stands out quite a bit. "Broad Swords, Musket-Gonnes & Doomsday Weaponry." Well swords are fairly obvious in refering to new melee weapons. Now, what is a Musket-Gonne? Some historical references refer to it as a small cannon attached to a Musket which fires a small explosive proectile. Kind of like a modern day gernade launcher attachment for a M16/M4. It is very possible that this refers to devices to attach onto weapons, like gernade launchers... Or perhaps a whole new weapon all-together. First column starts off with "A VIEW of the Weekly Essays and Controversies, spec.". This basically suggests that this page is an index and hint at whats to come. I. ARTILARY & MUNITIONS, viz. the Zepheniah Mann & Sons Co. Sulphurous Cannonading Projectiles & their profligate uses; the Musket-Gonne : Philosophy or Whitchcrafte? var. obvervations from Learn'd Men. Well lets see here. Back in the early days a Rocket may have been called a Sulphurous Cannonading Projectile. The use of Sulphur actually also indicated a incindary device rather then a explosive device. Musket-Gonne.. Well I think that this still refers to a new type of weapon, or weapon attachment which is Mortar or Gernade related. The fact that the word "Philosophy" is present, suggests perhaps that this relates to the Engineer. In Meet the Engineer, The Engineer appears 'Learn'd' or well educated. But in contrary to that, the engineer claims he doesn't solve "Philosophical" problems, but rather he solves "Practical" problems. II. VIRULENT POISONS, viz. the Zepheniah Mann & Sons Co. Vial of Toxiferous Plague & proper handling of same; Tincture of Mephitic Vapours & its intrinsicically volatile nature; Miasmatic Swamp-Gas Capsules & the proof of their quality by hue & texture. Very interesting. It seems that we will be getting some new poisons. Vial of Toxiferous Plague, Tincture of Mephitic Vapours, and Miasmatic Swamp-Gas Capsules. Now some are suggesting that these will be gernades but I believe that will be too over powered. I believe these will be poisons that can be applied to melee weapons or even possible bullets, which will have a temporary durration. Similar to poisons for Rogues in World of Warcraft which must be applied to the blades of their daggers in order to have any effect. III. PHILOSOPHY from var. Craftsmen on the Proper Construction of Zeppelins. Judging on the rest of the article, I am going to go out on a limb and suggest that this is a fragmented statement. The use of italics between Construction and Zeppelin suggest that they are 2 different things. I believe that this suggests that we will learn about how things are crafted. IV. DOMESTIC OCCURANCES. A List of Casualties, Burials, Chritenings & Beheadings. Domestic usually refers to things at home. I believe this will deal with stuff happening in Valve. Likely mentioning the rumored beta testing of TF2 2.0, or possibly mentioning layoffs for more leaked content. But I think the beta testing is more likely. Likely also listing new ideas in 2.0 and ideas that were nixed and removed. V. PHYSIC. Liniment Remedies, Magickal & Otherwise, for the Treatment of Maladies, Grievous Wounds & the Indisposition of Humours; also Bilious Fevers. Generally speaking, Liniment's are sold to relieve pain and stiffness. So these could improve mobility. Bilious Fevers refers to fevers which include vomiting diarrhea and nausea. In my judgement, these will be temporary items which you can take to counter the poisons. VI. POETRY & MUSICK on the Subject of Weaponry. I believe that this will be a new Meet The... Video. IN NEXT QUARTER'S PAMPHLET: "A Colloquy On The Soldier's Arte"
I am going to guess that this indicated that the soldier is getting updated next. After a careful examination of this page, I am going to conclude that I believe that this will be an overall classless update which will include new general weapons and introduce poisons. It is possible that Engineers will build Weapon Dispensers, Poisons Dispensers, and Healing Dispensers. 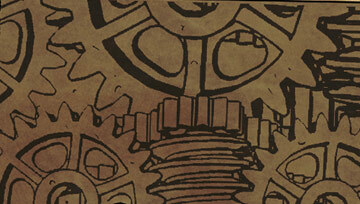 Also, there are more hints at the Engineer in GearingUp.jpg and teleporter.jpg. This very well could be the Engineer update in disquise, making the Engineer more useful by providing his team with various poisons, weapons or health potions as required. I imagine only one Dispenser can be equipted at a time. A Dispenser will buff a player, giving them a buff for a period of time. Perhaps the player can select which buff they recieve, or perhaps it is automatic. Weapon Buffs may allow weapons to fire special ammo, or even upgrade stock weapons. While poison buffs will infect anyone that the player attacks with a poison which will slow the enemy and induce pain. Healing buffs will revert, heal and protect against poisons.